The United States has vetoed a Kuwait-drafted UN resolution calling for the protection of Palestinians in Gaza and the occupied West Bank. Out of the 15 UN Security Council members, Russia, France and China along with seven others voted in favor of the resolution on Friday, while four including Britain abstained. US envoy to the UN Nikki Haley called the resolution a “grossly one-sided” view of the conflict between Palestine and the regime of Israel. 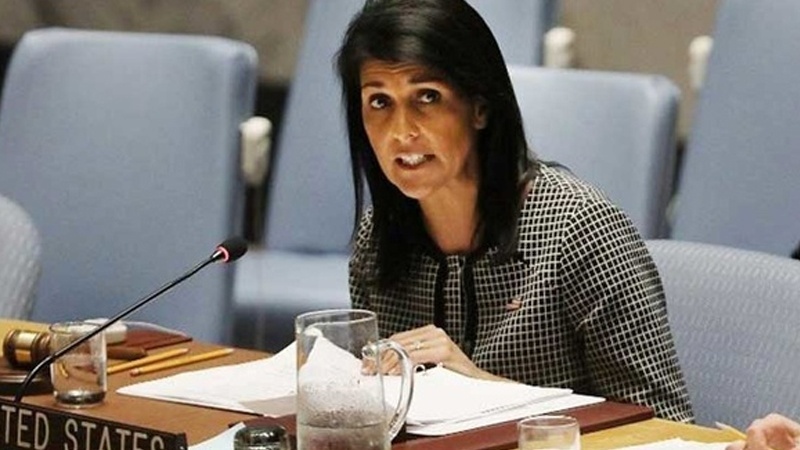 She also described Hamas as a major impediment to peace, proposing an alternative draft resolution which only gained Washington’s positive vote. During a second vote, when the US put forward its own rival measure, eleven countries abstained, while Russia and two others opposed it. At least 120 Palestinians have been martyred by Israeli forces since the “Great March of Return” began in the Gaza Strip on March 30. Fourteen children are among the fallen Palestinians. The occupied territories have witnessed new tensions ever since US President Donald Trump on December 6, 2017 announced Washington’s recognition of al-Quds as Israel’s “capital” and said the US would move its embassy to the city. The status of al-Quds is the thorniest issue in the decades-long Israeli-Palestinian conflict. The Palestinians see East al-Quds as the capital of their future state.